Is Jesus God? | What Does the Bible Say? The emotionally-charged debate focuses specifically on whether Jesus was God incarnate who died and then bodily rose from the dead the third day following His crucifixion. He is what He Himself claimed to be: both Lord and God. The statements above are just a few of the claims Jesus of Nazareth made concerning His eternally-existent deity. I know! I know! Most people don't like to think of Jesus that way. It makes them uncomfortable. They prefer to think of Him as "a good man", or "a prophet among many prophets"  and some will even go so far as to say, "He certainly had God's hand on him!" But, they just can't  or rather, won't  believe He was the long-awaited promised Messiah, God incarnate. This man claimed to have lived 3000 years prior to the day He walked in Galilee! He claimed to have a direct connection to the Father that no one else had! And, He actually claimed to be GOD! Stop and think about that. Jesus being only a "good man" is logically impossible. Here's why: If He is not God, then He must have been a liar, deliberately misleading the multitudes; or He was a lunatic, sincerely believing Himself to be God, when He was really just a man. However, how can Jesus possibly be a "good man" and crazy, or a "good man" and a liar? Really, there is only one logically consistent alternative: He was telling the truth. In addition to the logical inconsistencies noted above, the historical evidence of His remarkable acts shows that Jesus was neither a liar nor a lunatic. Again, the only position left is that His claim is true. Jesus is Lord and God! Of course, while perfectly logical, that argument is seldom sufficient to answer most skeptics. So, let's delve into the Bible which we know to be the best-preserved record of historical data among all ancient writings/manuscripts. What does the Bible tell us about Jesus and His true identity? Following is a brief discussion of a few of the prophecies concerning the deity of the Messiah. For an in-depth discussion of Bible prophecy, especially messianic prophecy, refer back to "Who Is Jesus: Messianic Prophecy". 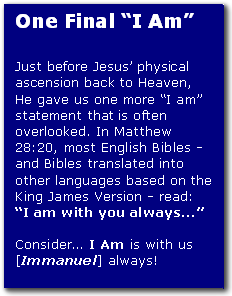 Note: In the Hebrew, "Immanuel" literally means "with us God". A Human Child Would be "Born", but the Eternally-Existent Son Would be "Given"
Fulfillment: One of the primary titles Jesus used for Himself during His earthly ministry was "Son of Man". This unique phrase has its background in the vision recorded in Daniel 7:13-14 where Daniel saw one "like a son of man, and he came to the Ancient of Days and was presented before him. And to him was given dominion and glory and a kingdom, that all peoples, nations, and languages should serve him; his dominion is an everlasting dominion, which shall not pass away, and his kingdom one that shall not be destroyed." The ruling priests and council of Jesus' day fully understood what He was saying every time He called Himself the "Son of Man". But they refused to believe it and added it [thinking it to be blasphemy] to their reasons for wanting to kill Him. To be clear, whatever or whomever we put first in our lives becomes our object of worship, whether we actually bow down to it/them or not. To put Jehovah/YHWH God first means to worship Him and to love Him with all our hearts, souls, and minds. Therefore, to worship anyone other than Jehovah/YHWH God was to break God's commandment, in fact, the greatest commandment (see Matthew 22:37-38), and was punishable by death (cf. Exodus 22:20; Leviticus 26;30; Isaiah 10:10-11). The disciples' actions clearly indicate that they acknowledged Him as deity. And Jesus did not correct them! As a devout Jew, if He were not God, He would have immediately commanded them to stop [as the angel did with John in Revelation 19:10 and 22:9], but instead, He accepted their worship  because He knew He really was God in human flesh. Because of Jesus' physical resurrection, Thomas acknowledged who Jesus really was, declared His true identity, and humbly worshiped Him. Jesus not only accepted Thomas' declaration and worship, but He blessed him and the other disciples for their belief. Many unbelievers today insist that Jesus never claimed to be God. But Jesus' listeners, especially those educated in the Scriptures [our Old Testament], understood that He claimed on many occasions to be divine. That is precisely why they wanted to kill Him! Jesus Claimed to be "I Am"
"Jesus said to them, 'Truly, truly, I say to you, before Abraham was, I am.' So they picked up stones to throw at him, but Jesus hid himself and went out of the temple." This is a powerful statement. First, He claimed to exist before His earthly birth; and second He took on the name of God, "I AM", which is the same title Jehovah/YHWH God used in Exodus 3:14 when He told Moses: "...'I AM WHO I AM.' And he said, 'Say this to the people of Israel, "I AM has sent me to you."'" There was no doubt in Jesus' listeners' minds that this Man standing before them was claiming to be God! So, in obedience to God's Word (cf. Leviticus 24:16, they picked up stones to kill Him! Could it be any clearer? Two thousand years ago, thousands of men and women heard His voice, looked into His eyes, and wondered at the commanding authority of His words. Unlike the skeptics of today, the Jewish rabbis never denied that Jesus claimed to be God. Not everyone believed, but they all knew He was claiming to be equal with God. If those who lived at that time drew that conclusion, how can anyone today presume upon their understanding? What did the people of that day mean when they called Jesus "Lord"? Why did Paul use this title for Jesus more than 200 times in his epistles? What does it mean to believe on the Lord Jesus Christ in order to be saved? Why does God say that every tongue will confess that Jesus is Lord? The dictionary defines "Lord" as "a person who has general authority over others". Another dictionary defines it "master or ruler". The word "Lord" actually comes from Old English meaning "bread keeper" or "loaf" "ward". The Greek word that's translated "Lord" in the Bible is Kurios, a title of authority. People used to say it to show respect, such as the word "sir". The head of a family was often referred to as the lord of his house, slaves called their master "lord", and subjects of monarchies recognized their ruler as their "lord". Kurios was also a title of worship given to the gods of other religions, especially to Zeus, the chief Greek god. And of course, it was a title of worship given to Jehovah/YHWH, the one true God. In this sense the Bible uses the title "Lord" for both God the Father and His Son Jesus Christ. To call Jesus "Lord" is to recognize His deity, His union with His Father, His supreme authority over the universe, and His right to rule our lives. He died and bodily rose again! He made ruined lives beautiful, pure, and useful. He drove evil spirits out of their victims. The laws that govern the physical body's functions also apply in the spiritual sense. The body does not guide the head, but the head guides the body. And just as the physical body has many different members [fingers, toes, arms, legs, skin, fingernails, heart, lungs, etc. ], so the spiritual Body of Christ has many members. And each member has its own place and function in the Body. As we all work together for the good of the Body, then we are able to more efficiently carry out the purpose of Christ, our Head. After Christ judges the Church, there will be a great celebration in Heaven known as the marriage supper [wedding feast] of the Lamb. The word "Lamb" is a designation of honor for what Christ accomplished on earth as the Lamb of God who takes away the sins of the world. In Revelation, Jesus is called the "Lamb" 27-34 times [the number varies depending on the Bible version one uses]. The church shares that honor as the Bride of the Lamb, Jesus Christ. Alpha and Omega are the first and last letters of the Greek alphabet, the beginning and the end. In calling Himself "the Alpha", Jesus is saying He is the One who initiates, who begins all things, the One who brings all things into being [see "God's Names: YHWH/Jehovah"]; and as our "Omega", He is God's final Word and assurance of fulfilling God's eternal purpose. As Alpha, He created all things and nothing exists that He didn't create (see John 1:3 and Colossians 1:16); and as Omega, He will bring all things back into their right relationship, subdue all evil, and reign forever as the King of kings and Lord of lords! This refers to Christians, not unbelievers. The Judgment Seat of Christ involves believers giving an account of their lives to Christ. The Judgment Seat of Christ does not determine salvation; that was determined by Christ's sacrifice on our behalf and our faith in Him (see John 3:16, 1 John 2:2, Romans 8:1) All of our sins are forgiven and we will never be condemned for them. We should not look at the Judgment Seat of Christ as God judging our sins, but rather as God rewarding us for our lives. Yes, as the Scriptures say, we will have to give an account of our lives. Part of this is surely answering for the sins we committed. However, that is not going to be the primary focus of the Judgment Seat of Christ. The Great White Throne Judgment is found in Revelation 20:11-15 and is the final judgment prior to the lost being cast into the lake of fire [the place of eternal punishment commonly known as hell]. This judgment will take place after the millennium and after Satan, the beast, and the false prophet are thrown into the lake of fire (Revelation 20:7-15). The "books" that are opened (Revelation 20:12) are probably symbolic, as God knows everything that has ever been said, done, or even thought and has no need of written records. Whatever the source, these are accounts of everyone's deeds, whether good or evil; and He will reward or punish each one accordingly (see Psalm 28:4; 62:12; Romans 2:6; Revelation 2:23; 18:6; 22:12).